Melbourne culture is vibrant and alive. You will find it in the streets and lanes, in bars and cafes, at numerous festivals, exhibitions and galleries. It is real, supported and lived by the people, and it has earned itself a spot in the international art and music scenes. The Melbourne style is many things: sophisticated, playful, unconventional, quirky, intense and multi-cultural. Melbourne culture comes as naturally as the next latte. Melbourne is the undisputed art and music capital of Australia. Find out what's on in Melbourne here. Through the course of the year, you will find numerous Melbourne Festivals such as the Moomba Waterfest and the Melbourne International Comedy Festival; the annual Melbourne International Arts Festival, Melbourne Fringe Festival and the Melbourne Writers festival, each a celebration of artistic expression. These are of course not all. On top of that, in case you are lost for something to do on a weekend, there is bound to be one festival or another going on. There are ethnic and community festivals such as the Latin Festival or the Indian Diwali Festival of light, and there are many celebrations such as the Sustainable Living festival, vintage car rallies, Rock, Jazz and Blues festivals. The performing arts scene is strong part of the Melbourne culture. There is a lively variety of Melbourne theatres that evoke and propel us. There is the Australian Ballet, the Opera, the Royal Melbourne Philharmonic and the Melbourne Symphony Orchestra. During the summer month you can catch a free outdoor ballet, concert or opera in the Sidney Myer Music Bowl. The Arts Centre Melbourne is the centre for these performing arts with a complex of theatres and concert halls located next to the Yarra. During spring and summer there are great live performances in the Spiegeltent in the arts centre forecourt. Throughout the city you will find more theatres than in any other Australian city, such as the Melbourne Theatre Company, the Princess Theatre, the Regent and Forum with many professional theatre companies in Melbourne producing an ongoing stream of world class theatre and musicals. There is also a large range of independent and interesting Melbourne cinemas where you can see arthouse films as well as the latest releases in movie theatres with great atmosphere. There is an event in Melbourne for everyone. Melbourne culture is rich with a lively jazz, rock and pop scene, which has given rise to many internationally known performers such as Olivia Newton-John, John Farnham and the Seekers as well as Crowded House, Nick Cave, Kate Ceberano, Missy Higgins and Anthony Callea to just name a few. However, it is the growing, diverse and independent Melbourne music scene that has taken work stage as an internationally highly regarded alternative, DIY, avant-garde, experimental and independent music scene and that is keeping the beat alive in Melbourne. Melbourne attracts the greatest international performers on their concert tours. 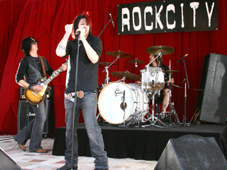 Throughout the year, there are also various free concerts throughout the city. But these are really just the top of the iceberg. The music scene in Melbourne is alive with live music venues, and many independent Melbourne Radio Stations , where you can soak up the local music happenings. Melbourne streets are lined with art installations. 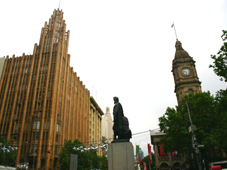 There are the historical monuments depicting important Melbourne personae like Batman and La Trobe. 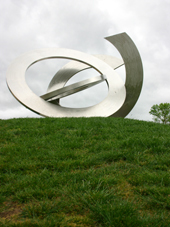 And there are many commissioned modern art pieces on many of the street corners and along the waterfronts. Graffiti Melbourne is another aspect of its culture. 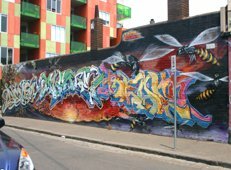 Melbourne has some of the best street art in the world and is know as graffiti capital. Overnight amazing creations appear on some inviting wall. Many of them works of art, many of them appreciated, there to stay and protected. 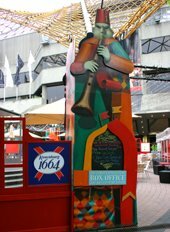 There are also the buskers performing around town, particularly along the Southbank and Federation Square, creating the colourful feel of a traditional market place. There is a rich art movement and history to Melbourne culture. As early as 1861, the National Gallery of Victoria was founded and was able to purchase many international master pieces. In the late 1880s, the Heidelberg School was the first large art movement in Melbourne, surrounded by a strong art community. Here is your Melbourne guide to Australian art . 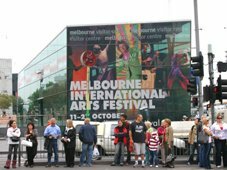 Today, there are numerous independent and state art galleries Melbourne can show off. However, what makes art permeate this city is it being alive in the community. There is always an art event in Melbourne that contributes to this creative city. Numerous artist initiatives and community art centres, such as the Abbotsford Convent, the artists colony of Montsalvat and the arts hub of the Nicholas Building keep the arts in the centre of Melbourne life. There is a Melbourne museum for almost any area of life, from natural sciences to hands on experiments for kids, to history, aviation, to trams and railways. Many of these are exciting places of Melbourne culture to visit, and a great way to spend a rainy day. You really get a taste and feel for what it was like, or how this or that thing works. The museums have come a long way from stuffy old Museums. Melbourne history is short compared to European cities and is associated with the development of a distinct Australian culture. It is just over 170 years old and had its heydays and exponential growth through the gold rush years of the mid to late 1800s. The wealth of that period is reflected in the Melbourne city guide to architecture . At the moment, Melbourne is experiencing another peak and it has become the fastest growing Australian city. Mixed within the old you will find pleasing and uplifting modern architecture around the Melbourne CBD and beyond. Dance venues are thriving in the Melbourne culture with some of the biggest nightclubs in the world. There are dance parties that take place most of the year, attracting some of the worldreknown DJs. Melbourne is the birthplace of the Melbourne Shuffle , a jazz style dance step performed to electronic rhythmic beats that developed in the 1980s in the underground scene and that continues to evolve to date.